Limited to 77 copies. Recorded by Vladislav Sikach in 2011-2012. New Year is all around already, all the parties ended, and now it's time to talk about a quiet music that will give an opportunity to have a meditative journey before new stressful weekdays. One of the biggest discoveries for me last year was Moscow based label Radiodrone with a pack of interesting releases. It is really nice to see new faces on the scene of dark ambient and drone music, the genres that were not that pampered with attention recently. 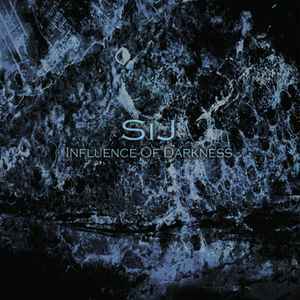 One of those records was from Ukrainian dark drone project under the code name Sij 'Influence of Darkness' which in its conceptuality tries to make a research on a thin border between light and darkness and the impact of dark times on human being. The first track of the album is kind of a preface, wide and deep atmosphere opens its doors to the listener, fills the air with a distant mechanical clicking and ticking, reminding a little bit of Raison D'etre. In the next composition the artist takes me on the walk between abandoned industrial buildings, where the wind plays with scrap metal parts, twangs rusted chains, breaking off sharp edges of what is left from the windowpanes. The usage of field recordings is not new in the genre of ambient music, and Vlad operates with all the possible tools to saturate the eyeballs with a load of generated sounds. Industrialized tunes roll all over the room together in a chaotic motion, but suddenly a tribal bit enters the scene adding a heavy ritualistic experience, and all the sounds start to get bound together like pieces of a huge puzzle creating an unforgettable atmosphere of some kind of an urban witchcraft when the air trembles charged with a high voltage; all the objects around start to dance together receiving this charge. The same urban magic is transferred to the third composition "See it Just" that is sawn around the field recordings of a city's everyday life. A hypnotic background hum drives this track forward when a creeping darkness slowly swamps the city taking control of all the human wishes and aspirations. And when the surface is already conquered by its power, "Zum" comes to set the new rules of days' darkest hours with sudden noises all around, with a distant tribal percussion that injects a slow rhythm of sinister underground rituals. The time comes and darkness demands an open heart to soak up its viscid juice, while the final track flows forth with its slow drone structure to make the absorption much easier. Thick layers of background hum are supported by an airy celestial melody, guiding the listener towards the light in the end of the tunnel; "Ambiguilty" is a definite logical end of the colorful journey. Vlad, the man behind Sij project, proves with 'Influence of Darkness' that there is hope for drone ambient scene and its worth to search for the pearls in this genre that can entertain each and every fan with creativity and passion. The sharp change of mood from track to track was a weakest point of this album for me, but despite this disadvantage the cd keeps a high level of arrangement. "I am a forest, and a night of dark trees: but he who is not afraid of my darkness, will find banks full of roses under my cypresses" - I feel that Vlad already found his banks full of roses and shared them with us through this strong album.